Tiramisu, How Divine Are You! One night several years ago, my husband decided to indulge my craving for chocolate chip cookies and and took it upon himself to make some. He does not bake. Ever. But he took on this task with–dare I say it?–some enthusiasm and set to work while I lounged on the couch, amused by the role reversal. When he was finished, he proudly presented the fruits of his labor with a huge grin spread across his face. They looked like cookies, they smelled like cookies, they weren’t even burnt or anything. I bit into one, ready to savor his masterpiece. Mid-chew, I paused, unsure. Something wasn’t quite right. I chewed some more. What was it? They were tasty, but I was so thirsty. It turns out, since hubby isn’t used to reading recipes, he mistook the abbreviation for “teaspoon” to mean “Tablespoon.” Or that’s what he told me, anyway. It could have been that he just wasn’t paying attention, something I’m often found guilty of. I think it was more likely that, but he’s sticking to his original story. In any case, the salt was increased three-fold. At least. And as weird as they were at first bite, these cookies were addictive. Sure, you needed a tall drink at the ready to combat the side effects, but we couldn’t stop eating them. We gave some away–with fair warning–and the recipients experienced the same. They could not put them down, despite the saltiness. Hubby doesn’t bake much still, but he did learn an important lesson that day about measurements. I, on the other hand, discovered the value of salty + sweet. It’s like those chocolate-covered pretzels that people go ga-ga over. We can’t get enough of these seemingly incompatible flavor combinations. This cookie is a similar idea. Not as salty as my husband’s accidental discovery, but you could alter them to be so, if you wish. You’ll need flaky sea salt. You can get away with fine sea salt, but the final product looks so much nicer with the flaky finishing salt. And make sure you splurge on good quality white chocolate–the cheap stuff isn’t white chocolate at all but some fake creation. Go ahead, look at the ingredients list. I discovered recently that my local grocery store stocks Callebaut blocks by the deli in the International Cheese section. This might be a good place to check if you’re in an unsophisticated town like I am that doesn’t normally deal with gourmet. 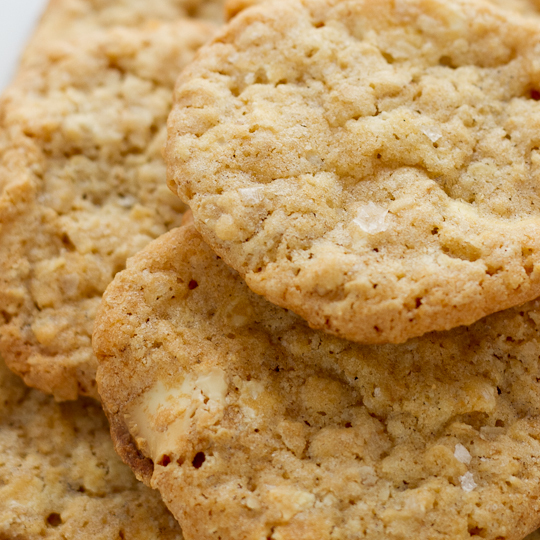 Ghirardelli White Chocolate baking bars are also decent, but skip their chips–they don’t have the same ingredients. You want to be sure there’s cocoa butter there. Lastly, pay attention to your baking surface. The Pampered Chef baking stones, for example, will give you less crispy cookies than your typical non-stick steel cookie sheet. If you want these to come out with the “crispy on the outside, airy on the inside” texture this recipe is known for, you’ll want to use the non-stick baking sheets. Parchment paper will save you some clean-up after. Preheat oven to 350 degrees Fahrenheit. Line cookie sheets with parchment paper and set aside. 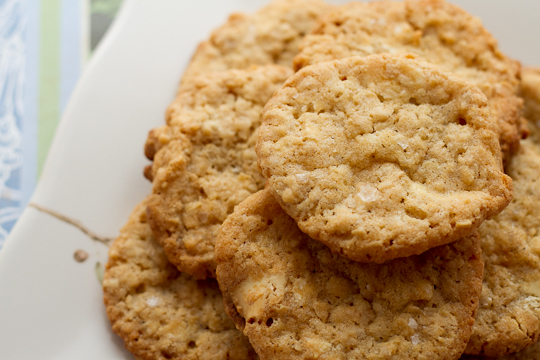 In the bowl of an upright mixer, cream together butter and sugars until light and fluffy. Add the egg and vanilla, beating until fully incorporated. Sprinkle the baking soda, baking powder, and sea salt around inside the bowl and then gradually add the flour. Once completely mixed, add in the oats and then remove from the mixer. 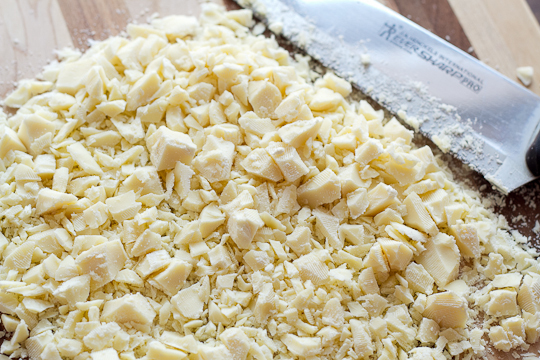 Stir in the white chocolate by hand. 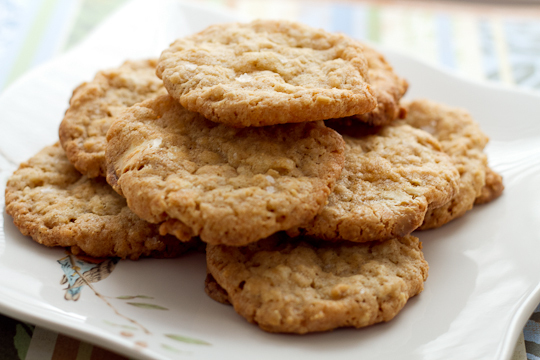 Drop onto cookie sheet with small cookie scoop or spoons and press lightly on them to flatten a bit. Sprinkle flaky sea salt on top to your taste (I was heavier handed than smitten kitchen). Rotating the pans halfway through, bake for 12-14 minutes, or until golden. Remove immediately to wire racks to cool. Cute story, and these look so yummy!! Love the tips too. Will look specifically for that chocolate! Thanks again.